IT’S harvest festival time. Time to raid the back of your cupboards and send your offspring off to school with a can of chick peas and a pack of cup-a-soup – preferably not out-of-date. It’s a terrible thing, how half-hearted you get after throwing several children through the education system. With your first child, in their first year of school, you’re brilliant. You’re efficient. You bake cakes for the fête rather than buy them. You turn up on time for everything, try your hardest to read with them every night, analyse their every comment about what they did that day and worry endlessly that you aren’t doing something right and are going to stunt their education forever. Then by the time they start their second year, you’ve chilled out a little, realised that the staff pretty much know what they are doing. You get more into the routine – parents evenings, outings, library books, PTA events, the nativity – it’s been done for decades and it works. That’s not to say you neglect your second/third/fourth children. Far from it. 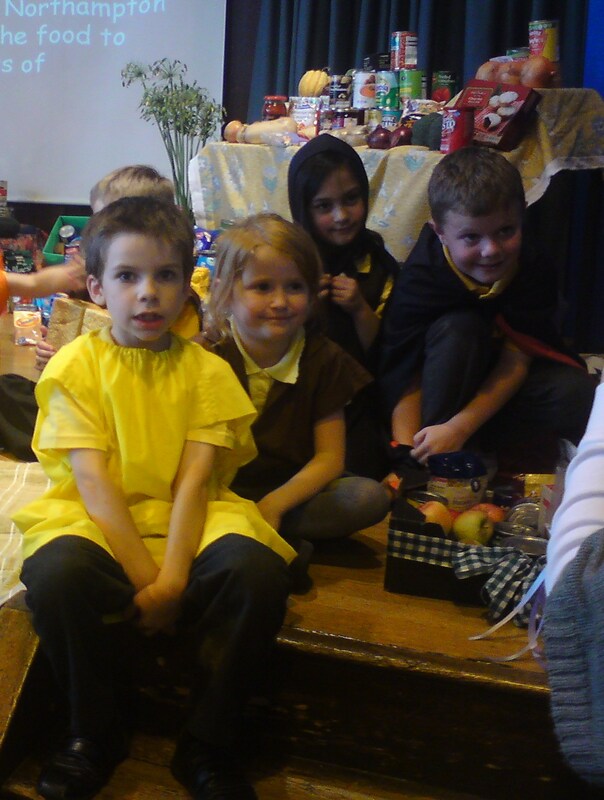 I loved Billy’s harvest festival assembly last week just as much as when my elder two boys took part in years gone by. You can’t stop yourself grinning, trying to wave at them from the back of the hall, and mouthing their lines when it’s their turn to speak on stage. Billy’s enthusiasm for his class’s harvest festival assembly re-ignited my enthusiasm. This time, I wouldn’t send Billy with a tin of sardines for the food parcels for the homeless and elderly. I was going to send in a proper harvest. From my overgrown allotment. A genuine sacrifice for those less fortunate. UNfortunately, harvest festival came a little late in the season, which meant the offerings weren’t exactly, er, supermarket-pristine. There were misshapen carrots, proudly grown and picked by Billy. The last of the (probably a little stringy) runner beans, a courgette, too many green chillies (put in a sealed bag marked ‘CHILLIES!’ to avoid any painful curiosity) and the piece de resistance, one of the three ripe pumpkins being saved for Halloween. Billy made me carry it, partly because he didn’t want to drop it going across the playground, mostly because it was heavy. When I arrived at the assembly, I found myself peering at the stage, searching not for my gorgeous, excited seven-year-old son, but for the pumpkin. I thought, ignorantly, that it might be the only one. No, face it Hilary, other parents can grow things too. My fellow mums tried to help: “Is it that orange one at the back?” suggested one. No, too wrinkly. “That other orange one? “That greeny-orange one with the pointy stalk?” No, I’m sure mine was much bigger. Oh, no, that’s it. Nothing special, nothing massive and impressive. Probably not enough for a decent vat of soup at the Hope Centre. I’ll have to do better next year. Or stick to the sardines.